500 gr monkfish, 250 gr clean cuttlefish, 200 gr shelled prawns, 1 kg potatoes, 1 large red bell pepper, 1 bulb of garlic, 2 sofritos, 1 bay leaf, 1 pinch of salt, white pepper, 1/2 cup of brandy, fresh chopped fennel, olive oil. 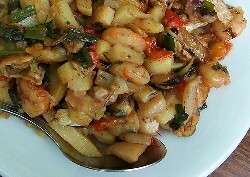 Dice the monkfish, cuttlefish and shelled prawns and lightly fry separately. Drain and set aside in a very hot earthenware pot. Fry the thin long slices of potato separately. Once fried, mix with the fried fish already prepared. In another frying pan, fry the garlic, add the bay leaf and add the finely chopped red bell pepper. When the pepper is almost cooked, cut the sofritos and mix with the pepper. Once the sofrito is cooked, drain all the oil, add the fennel and mix all the ingredients. Season with salt and pepper, flambé with brandy and drizzle with extra virgin olive oil. The fermentation of this cabernet sauvignon was made starting from the oldest cabernet sauvignon vines in Mallorca, which were planted between the years 1969 and 1986. With the purpose of extracting colour and enhancing the aromas, the fermentation was carried out at between 26 and 28 degrees. It then remained 12 months in French, American and Hungarian 225 and 300 litre oak barrels. Appearance: Intense red colour with a bright purple finish. Nose: It is a full-bodied wine with forest fruit aromas and a note of vanilla and coconut from ageing in French and American oak barrels. 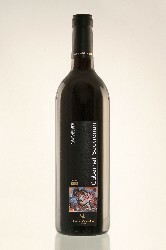 Palate: It is a wine with very marked tannins, but these are gentle to the palate with a marked, unctuous aftertaste. A wine that, no doubt, will age with very good conditions. 500 gr lamb entrails, 200 gr cooked intestine, 200 gr cooked blood, 100 gr artichokes, 100 gr peas (clean), 250 gr spring onions, 25 gr fennel, 750 gr peeled potatoes, 2 dl olive oil, 2 bay leaves, 1 bulb of garlic, 1 guindilla, salt and black pepper. Chop the lamb into small pieces and fry in a frying pan with oil. Add the guindilla, bay leaves and garlic cloves. 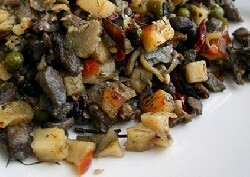 When the meat is soft and slightly brown drain a little and set aside in a “greixonera”. Finely chop all the vegetables and fry separately in the same oil, adding more if necessary. Add to the “greixonera”. Add the intestine and blood with the very finely chopped spring onions. Finally, add the thinly sliced fried potato and chopped fennel. Mix everything in the “greixonera” and taste for salt. Red with 100% Merlot aging from the Son Prim wineries. After the malolactic fermentation it is put in fine-grained new French oak barrels and others. Appearance: A wine with a deep cherry red colour and a slightly matured trim that gives it a maroon hue. Nose: Good intensity with aromas of ripe black plum, toasted coffee, graphite, vanilla, black plum, perfectly integrated wooden notes and a fresh balsamic undertone. Palate: It has a sweet start which is perfectly balanced by an excellent acidity, good body and range with firm, well-polished tannins. Attractive character.